“I feel like education has been moving in a really good direction; schools are getting that they have to be there to support students’ mental health, we have to take care of racism and make students feel safe and this is just setting us back in so many different ways.” Nicole Luinenburg, high school teacher in the Peel District School Board told me as crowds of teachers filed onto buses. 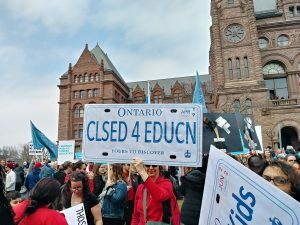 Two days after more than 100,000 students from 700 high schools across the province walked out of classes to protest education cuts, Ontario teachers, education workers and community allies brought the fight to Queen’s Park. More than 30,000 came out to oppose Doug Ford’s plan for education. Read more! Today on the show, Marco Luciano, director of Migrante Alberta. Migrante is fundraising for a workers centre, where migrants can connect to resources, each other,and organize. 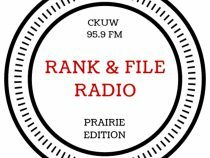 We’ll talk about Migrante’s new Fort MacMurray chapter, the U.N migration compact and Jason Kenney’s changes to the temporary foreign worker program as federal immigration minister. Read more! 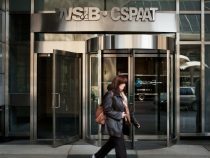 Since March 21, Workplace Safety and Insurance Board (WSIB) staff members across Ontario have been staging walkouts over systemic workload problems that are causing tremendous stress and impacting the organization’s ability to serve injured workers. The rolling protests began with about 100 people demonstrating outside the downtown Toronto office and will cover all 14 WSIB locations in the province. Read more! 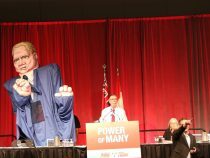 The political ground in Ontario is shifting. On April 4, 150,000 high school students from 700 schools across the province walked out of class in protest of the Tory government’s proposed cuts to education. Just two days later, over 30,000 teachers, education workers, and allies rallied at Queen’s Park against the cuts. These are the largest mobilizations against the Ford government to date. Read more!